On Sunday, Feb. 10, at 7 p.m., the Great North Woods Committee for the Arts is hosting a fundraiser concert at the Colebrook Country Club for the new Center for the Arts facility in Columbia (the former Shrine of Our Lady of Grace). The new Arts Center was purchased in July of 2018 by the GNWCA and is presently undergoing infrastructure upgrades. For the fundraiser concert, the GNWCA has secured the trio known as the Bayley-Hazen Boys from Barnet, Vt. The popular band provides first-rate bluegrass music fresh from the hills of Vermont. 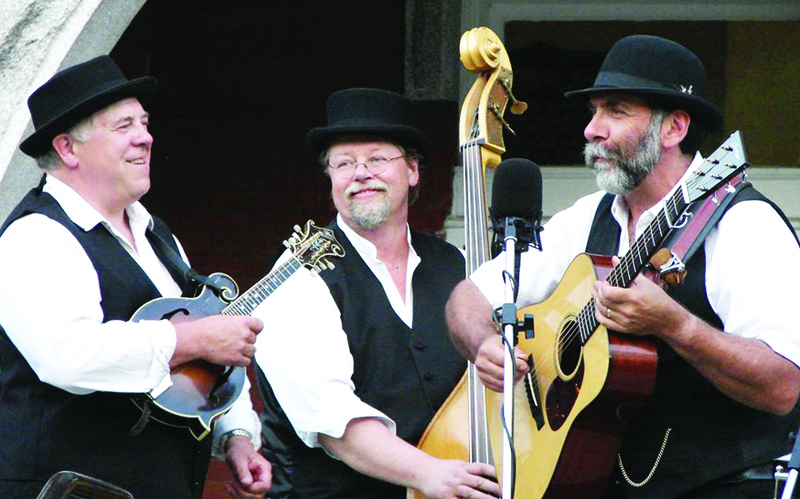 The trio are former members of the bluegrass band Gopher Broke. Bluegrass Unlimited describes them as “seasoned pickers,” with Steve Wright on guitar and vocals, Gary Darling on mandolin and vocals, and Chris Cruger on bass and vocals. The three are also members of the well-known band Bob Amos & Catamount Crossing. Darling and Wright have penned numerous tunes, and the band also plays favorites by such well-known musicians as Bill Monroe. The “boys” write their tunes about their homeland in the Northeast Kingdom as well as about running rum and other down-home topics. The Great North Woods Center for the Arts will be the host site of several activities starting in spring and is looking forward to bringing more great music and the arts to the North Country.